Tips The most important reason why Istanbul has developed as a world metropolis is the geopolitic; location of the city. Istanbul, located where the 48. north latitude and 28. east longitude intersect, is the only city in the world which is established on two cointinents. The city consists of three parts in general; On the European side, the Historic Peninsula to the south of the Golden Horn and the Galata District to the north, and the New City on the Asian side. The European side of the city is a trade and business center, whereas the Asian side is more of residential area. Istanbul is established on the both sides of the Bosphorus, that connects the Black Sea and the Sea of Marmara, and separates Asia and Europe. The 7 km. long narrow inlet, named as the Golden Horn, divides the European side of the city into two. Because of its location between Asia and Europe, the city always had a great geopolitical importance, Today, Istanbul is still a political and commercial center for the Balkan and Middle Eastern Countries and the Turkic Republics of Central Asia. The settlement, known as Byzantium after its founder, took the name Constantinople, the city of Emperor Constantine, during the reign of the Roman Emperor Constantine the Great. It was then known as Istanbul after the conquest of the Ottomans, and became one of the biggest and the most crowded city of Europe. The city is spread over an area of 7.500 km2, 150 km. long and 50 km. wide. Although its population is not accurately known, it is estimated to be 12 to 15 million. Because of the continuous immigration from the rural areas, the city grows rapidly and the population increases around half a million every year. Each year, 1.000 new streets are constructed within the city, and brand new settlements rise on the east west axis. The population of the city, with a %5 annual increase, doubles in every 12 years. One out of every five citizens, is living in Istanhul. Around 2 million tourists visit Istanbul every year, and admire the historical and natural beauties of the city. Istanbul, where East and West, Asia and Europe meets, is a world city that different cultures and religions create the most harmonious synthesis. With particular consideration of historical monuments and cultural richness, Istanbul may only be compared to Rome, which carries so many similar characteristics. In Rome and in Istanbul, which was the capital for both the Byzantine and Ottoman Empires, administrators and governors constructed the greatest religious and civil structures, and decorated their capital cities with the most beautiful works of the famous architects. The Bosphorus is unparalleled for its natural beauties such as the Golden Horn and the Islands. Its moderate climate, active night life, lovely people, and the excellent Turkish Cuisine are some of the other factors, which make Istanbul an attractive destination for foreigners. A foreigner wishing to know Istanhul closely should spend at least a week in this beautiful city. Istanbul really is the place where east meets west both physically and culturally. European side often feels more eastern. traditionally dressed women slip demurely into the background. All this is happening in what is, technically at least, part of Europe. good as any further west. beauty, as well as tourist tat, await you in the centuries-old bazaars. between east and west give it a vibrancy and energy unmatched anywhere else. months when you can sometimes just about have them to yourself. the light of 30 million gold tiles. It is truly unforgettable. outshine Aya Sofia. He almost succeeded. ornate gardens seems to have a place for everything, even a circumcision room. Check out the enormous and sumptuously furnished harem quarters which were once guarded by eunuchs. relaxed and supple as a baby. extremely well priced in comparison to their more western counterparts. countries such as Russia, France and Italy. steak. This is one to book for a special night. price is right. You would find it hard to spend $10 here. offers meat-free versions of Turkish dishes and other healthy alternatives. Istanbul is effectively divided into 3 parts, one in Asia and two in Europe. is worth a trip over just to say you have been there and to see the views. Sofya, the Hippodrome and the old city walls. walk, you will see more that way. 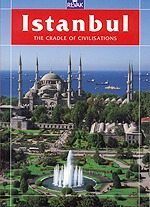 Istanbul book by Revak is not printed any more. We do not have any copies.